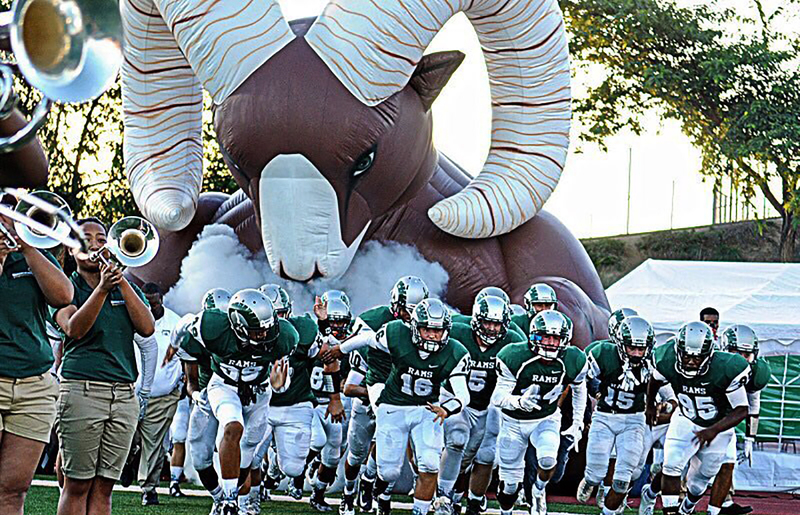 Murrieta Mesa High School’s request of us was to take products they had seen at other sporting events, but make them more unique, custom, and crowd-exciting than what the norm was from other schools. 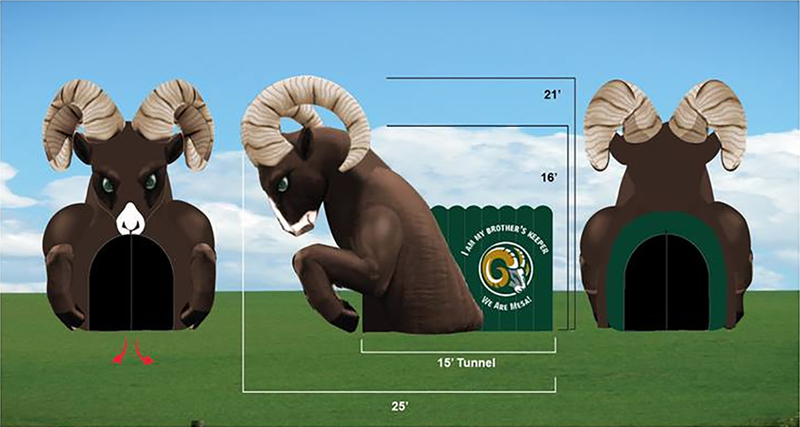 We created a 25’ fully custom ram mascot replica with incredible detail and custom printing on the tunnel section. Also included was special tubing through the inflatable connected to a programmable smoke machine that will blow smoke/fog through the nose of the inflatable. Standing at 21’ tall by 25’ long, with enough room in the tunnel to house the football team for on-field introductions, and with the effects of the smoke billowing out of the front of the inflatable, this display quickly became the benchmark for high school sports in the inland empire. This inflatable has been used for multiple sports and for both indoor and outdoor events. The second aspect for this schools sporting events displays was a massive run-through banner, but one that could be re-used for years to come, as compared to the paper ones that only last for one use. Using lightweight but very durable fabric material, we fabricated a fully custom digitally printed break-through banner the gives the appearance to the crowd of being 1 huge banner, but separates in the middle as the team runs through it. Light weight to be easily held up at games, but durable enough material to last for years to come.